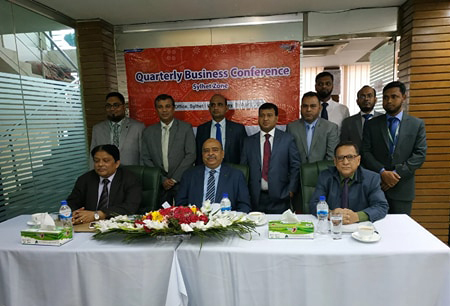 Quarterly Business Conference of Sylhet Zone of First Security Islami Bank Limited held recently. The conference was presided over by Mr. Syed Waseque Md. Ali, Managing Director, First Security Islami Bank Limited. Among others, Mr. Abdul Aziz, Additional Managing Director, Mr. Kazi Motaher Hossain, Zonal Head, Sylhet and Branch Managers of Sylhet Zone attended the conference. The conference reviewed the operational performance of individual branches for the period of January-March, 2019 and instructed to achieve targets for next periods of the year.